I don’t want to go giving it away, after all. I want to build hype. Create a buzz and want for my book. I have no doubt this will happen, just by how many people is the key here… I promise not to create the kind of hype like that of say Masterchef, by cutting to an ad break as the climax is about to hit. I want us to climax together, as it were… Maybe just the kind of hype that the latest apple product creates. We’ll see. Anyway, much more on that to come obviously. This week has been interesting for more than just mindmaps, pitches and central questions etc. That’s some author jargon, don’t worry about it. It’s just how I speak now. I also had to get my hands on a new meat, of course. However, this wasn’t just a simple phone call and request like normal. No no. To get this meat I had to make many many phone calls. And then I had to make more again. It’s actually been a solid few weeks of organisation for this one. 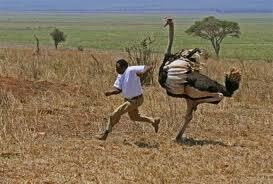 In a scenario much like a wild goose chase, I went chasing down some Ostrich! I didn’t actually chase down an ostrich. I mean those guys are pretty fast. I’m fast too, don’t get me wrong. Mum always told me I was speedy. But the ostrich can run at speeds around 70kph (kilometres per hour- for our non metric system friends), I, however, cannot. So I called heaps of people and finally Peter at Priam Meats, who are based in Southern New South Wales- a good 300km away, came to the party and said he could get me some ostrich trim. No one else said they could, so we got thinking and managed to organise a drop off/pick up with one of his drivers at a designated point in Western Sydney, which I would venture to once I had liaised with said driver- Nick. Now I have to admit, I do some extreme things for this challenge like eat lamb’s balls, but driving out to the back of a warehouse lot, winding down the window and taking possession of ‘a package’ seemed more drug runner than meat enthusiast. But what would this year be without a bit of mystery, cloak & dagger stuff. Kind of. I tried talking in code, I think Nick thought I was drunk. With Ostrich trim on board it was time to do something with it. To the unwise, trim is parts of other cuts of meat that are ‘trimmed off’ during the butchering process to make those cuts look nice and pretty for YOU. These are then minced to make, ahh, what was it… oh yeah- mince! So I took my trim to Kristy at The Butcher And The Chef and she minced it all up for me (Thanks again Kristy!). What does one do with 800g of ostrich mince? This dear reader is a very astute question. I mean where do you start? Spaghetti bolognaise? Mince and cheese pie? A childhood favourite in New Zealand- mince on toast? No to all the above these days. I was tempted to create a bun-less burger similar to the chicken & mushroom stack I did earlier this year, but this deserved some originality, and when NN requested a recipe she loves that I’ve done once before with beef mince, how could I pass up a pretty lady?? Bacon, kumara and ostrich pie for dinner? This is not a pie in pastry, but more a Sheppard’s Pie style dish. The danger was that the dish would take away from the meat, but on this occasion I couldn’t help pleasing my girl. I got close to not making dinner when the bacon got cooking. This is one of life’s happy smells. I was very tempted. Need winding down at the end of the day? Cook some bacon then try and not relax, smile and enjoy the pants off it. I dare you. With the bacon cooking, the ostrich added and the kumara boiling I chopped the onion, garlic and shredded the carrots to be added to the browning meat. I’ll spare you all the details, but note that I added the other ingredients, some love and magic and soon the pie was in the oven, looking and smelling divine. What next for this long legged, head burier? 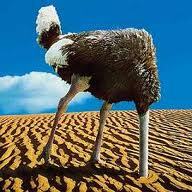 No longer with the ability to bury its head in the sand, it had to settle for being buried in a pie. And soon, my stomach. I got some broccoli and asparagus gently steaming while making a little Jamie Oliver inspired sauce to dress the greens. This was an olive oil, soy sauce, garlic and sesame seed delight. How did the pie turnout? Nothing like the pies I ate on an all too regular basis at University, that’s for sure. This recipe is simply delightful. The flavours of cinnamon and nutmeg, as well as the dates and kumara really add to the flavour of the meat. Which is the all important judging character… As stated above, the flavours were immense and therefore it did make it hard to get a real idea for the ostrich meat, however, going on the fact that the pie was still awesome tasting, I think I can say with confidence that the ostrich meat was a complete winner! Of course I wasn’t fully satisfied with this option, so I had snuck a single meatballs worth of mince out before cooking and made a little ostrich meatball last night to have with breakfast this morning, and hopefully get a better idea of how this meat tastes when not accompanied with lots of lovely friends. I cooked it too long and it was dry as all hell, but did give me a better window into the meat itself. It was a strong flavour, but ultimately undone by the cooking. Can you run over 70kph and have a thirst for hunting big game? If that’s the case then go to Africa and start chasing some ostriches, you could probably catch one and eat it. And that my friends, is week 42. I now have 10 left. Holy crap! I’ve got all sorts of ideas, words and awesome stuff currently flowing through me. However, you guys are my faithful readers, the ones that ask me questions and keep me honest. So what I’d love to do right now is extend an open invitation to send me your questions about training, food, health. Any frustrations you have, common and repetitive problems you face in your quest to improve your body and health? Even hit me with suggestions, you may just feature in my book!! The comments section below is open for you to have at it. Alternatively click contact Mike above and send me an email. 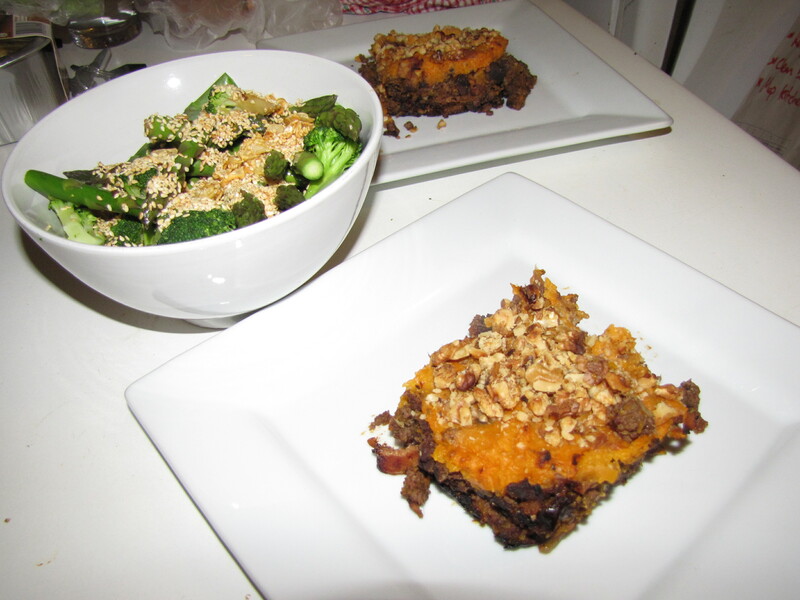 Also thanks this week to Civilized Caveman Cooking Creations for the recipe inspiration. One thing that I would love to get my hands on, would be some type of conversion table for ‘carb, grain’ replacements in a diet. I’m not a massive bread or grain eater, but whenever I’ve sort nutritional advice I always get meal plans, etc with grains ie. rice or rye bread or wraps or something. Really?! I usually just ignore it and add some more veggies. But I’m never sure if I’m adding the right thing or amount. Have you seen anything around the traps? Or have something handy? Thanks for the question. Sure, there are some great and better option replacements for bread and grains. Two places to start are with quinoa and buckwheat (which isn’t actually wheat FYI). These are much higher in beneficial nutrients and are much less aggressive on the digestive system that grainy carbs. From there exactly what you’re doing- vegetables. The more the merrier! I’ll contact you regarding more specifics. Thought of another one for you – at least I don’t think it’s made the list yet – and having been there done that I can attest to coming out the other side alive – Guinea Pig! Thanks for the suggestion Ol. I’ve made a few calls and looked around online. Seems difficult, unless I play butcher….